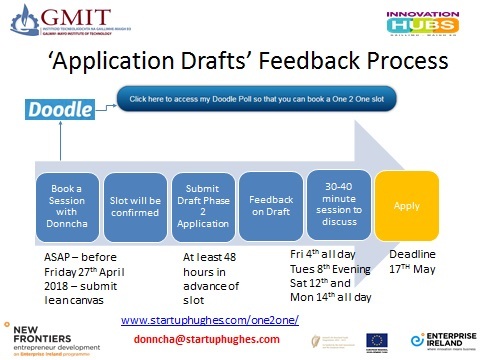 All participants who wish to avail of a slot are required to send a Lean Canvas and a draft of their completed application form to Donncha at least 48 hours in advance of the selected One 2 One slot. Please read the rest of the blog article before clicking on the Doodle button. Please provide your email address by leaving a message on the system or email Donncha directly. * In some browsers my name may be in the ENTER YOUR NAME box, so please replace with your own name. You have to press SEND twice, once to book the slot and again to send me a message. You wont get an email confirmation from the Doodle system – because this doesn’t require an email address to book. In the image above, it shows that the first two slots on Friday 4th are already booked – you will only be allowed select an available slot. It is a ‘first come first served’ basis but I will unbook and cancel slots if I dont get the required documentation in advance. 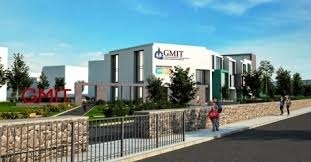 The venue is iHubs Boardroom in GMIT. This is on the top floor. Details of parking will be sent to all participants in advance of the One to One session. Remember to send me a message with your email address because I won’t be able to contact you otherwise. Donncha will send feedback on your draft application by email in advance of the meeting. 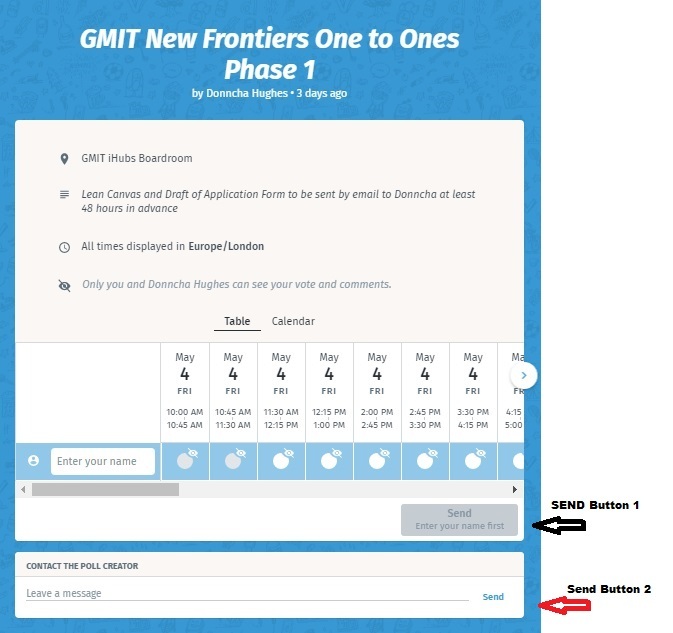 The one 2 one is then to discuss the feedback particularly how the application can be strengthened. Team members particularly all co-founders are encouraged to attend. The key question is whether the application represents the full potential of the business concept.